We've used Semex ai24™ since the Autumn of 2013. The system finds 90% of the cows in heat. At first we thought that wasn't possible, but it's true. We get our cows pregnant faster, our expected calving interval is 30 days less and we use hardly any hormones. With the pedometer, activity is monitored and we receive attention alerts for any disorders at an early stage. Plus, I have more time for my family! "I really consider Semex ai24™ to be a full-time employee. We've expanded from 350 to 500 cows since the installation and not added any people. The system helps our team make the best use of their time." 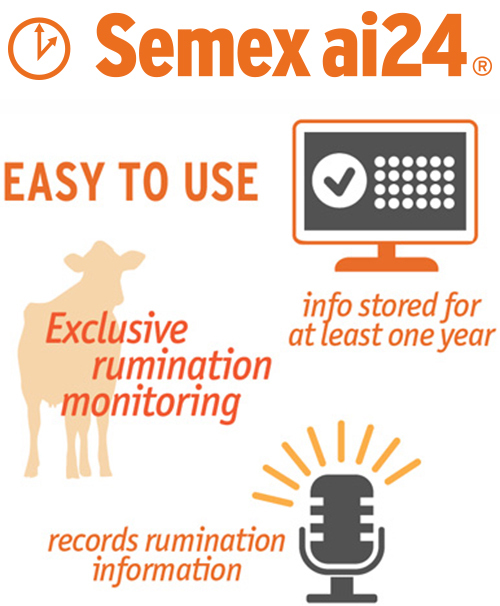 "We find Semex ai24™ easy to use and a timesaver. With several farm personnel using it, we needed a simple system to improve our pregnancy and conception rates. Semex ai24 is simple to learn and our employees can easily understand it. Our Semex representative set up training for my employees and he helps us watch our reproduction numbers. He's part of the team working toward our goals." Automated activity monitoring systems are now the backbone of many herd reproductive management systems.This technology is helping herds achieve reproductive results that seemed impossible only a decade ago. The growth in usage and performance of activity monitoring technology is one of the reasons we are now seeing many herds achieving a pregnancy rate of 30 percent or higher. 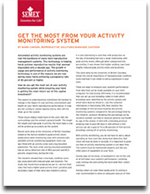 How do you get the most out of your activity monitoring system while ensuring your herd is getting the most returnout of this capital investment? The easiest to understand but sometimes the hardest to change is the impact of cow nutrition, environment and health on your herd's reproductive performance. If cows are not cycling or cannot express estrus, they will not show up on the system. These issues always relate back to the cow's diet, her surroundings and the animal's general health. The longer the length and high peak in activity, the more likely a cow will be picked up accurately by the system. Recent work done at the University of British Columbia looked at the factors related to peak activity levels and duration when monitoring cows with commercially available activity monitoring equipment. Each cow was fitted with an activity collar and a leg-mounted pedometer. The neck collar and leg-mounted pedometer had an estrus detection rate of 89.6 percent and 85.5 percent, respectively, during the trial. The research showed that a low body condition score was associated with reduced peak and duration. The study also found more pregnancies per A.I. service from cows that had a higher peak activity level. Lactation and secondary signs of heat were also related to estrus. There are many advantages to collaring all the cows, from saving time moving collars to additional health monitoring benefits and early abortion detection. If you do not budget time for this work to be done, you will not get the full benefit from the system. Using this technology to its full potential, including all the additional features, will have the greatest impact and benefit on your herd. Depending on the manufacturer and how much you are willing to invest, there are a variety of options that can provide data on the cows in your barn. Find out what the technology can do for you, set out goals on how you're going to use it and then invest the time to make it work. Technology is helping herds achieve reproductive results. EastGen's ai24...Put time on your side. Whole herd management systems with both rumination monitoring and heat detection capabilities. EastGen's ai24TM Customer Warranty Request Form: Please complete this form for all ai24 / Heatime tag warranty requests. ai24 Health Reports are a value-added necessity for progressive dairymen. How do you know you are feeding as well as you can? ai24 monitors rumination which is a must for progressive dairymen. ai24 - You're answer to best manage your herd 24 hours a day! ai24 - Improve your pregnancy rates with EastGen's ai24. ai24 - Can make the best of a bad situation.